Are you tired of all those expensive candle, jewelry, makeup parties, etc..? Now it’s time to step into the new party era!! Host a Tanning Party and let I WANNA GLO come to YOU! Get a group of friends together and indulge yourselves with a gorgeous GLO from a Master Certified Spray Tan Specialist. Your friends will love leaving with a GLO and waking up looking like they just walked off the beach! They will thank you the next day for sure! Or just a great excuse to have friends over! Each person will get a custom full body GLO! *Hostess not included in the (5) person minimum. but what about your tan? Look and feel fabulous on your Wedding Day! We can give you a flawless and natural looking tan for your special day. Look your best with a Custom Spray Tan from I WANNA GLO. 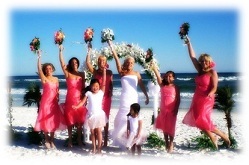 Make memories and arrange for the entire Bridal Party to GLO! Make it easy on yourself. Relax. Let us deliver your GLO to you and your entire Bridal Party at the location of your choice. We know how important it is to look your best on your big day. Get a trial GLO a few weeks before the wedding and one for your big day! One GLO for the wedding day and two others for special occasions of your choice such as engagement pictures, bachelorette, or shower! Each person gets a custom full body GLO!